The Lost Tomb of Jesus, a documentary aired on the Discovery Channel, claims an ancient tomb discovered in Jerusalem may have held the bones of Jesus. Author Louis Lapides argues that the implications of such a find could drastically alter the historic faith of Christianity. What if the bones of Jesus of Nazareth were discovered? How do we respond to claim that the tomb contains an ossuary inscribed with the names of Mary Magdalene and Yehuda the son of Jesus? Were Jesus and Mary Magdalene secretly married and gave birth to a child named Yehuda? Using apologetic tools to support the resurrection of Jesus, in Burying the Jesus Family Tomb Controversy Lapides explores the major claims professed by the Discovery Channel documentary and refutes the validity of these arguments. For those concerned about the contemporary attacks on the person and work of the Messiah Jesus, Burying the Jesus Family Tomb Controversy puts these harmful accusations to rest. 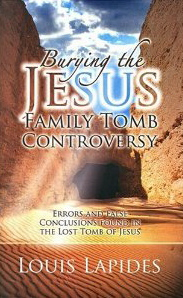 To order my booklet Burying the Jesus Family Tomb Controversy at the reduced price of $2.50 go to Amazon or the ScriptureSolutions Store.